I always look forward to checking out Facebook on Halloween night to see friends post photos of their kids’ costumes that evening. I too take the obligatory photo of Stella and Hazel in their costumes on the front porch each year before they run off for the first house to trick-or-treat! But after Halloween, the photos tend to get buried on my phone or computer. 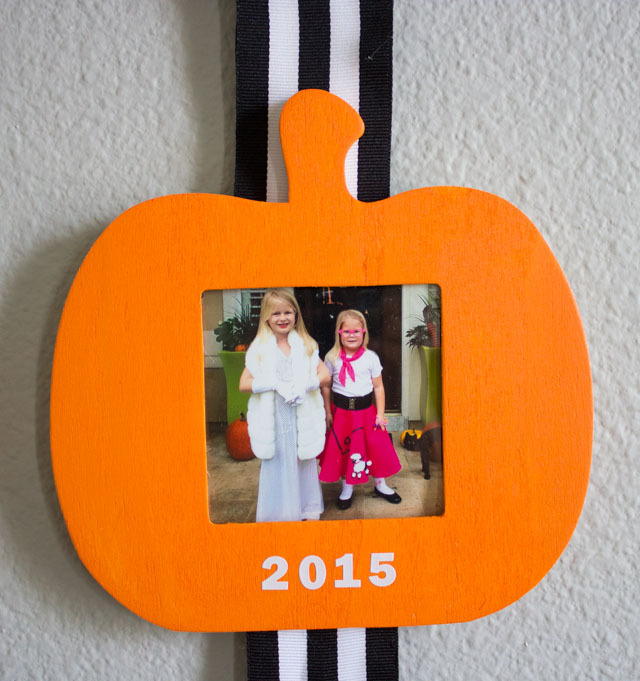 Instead of losing these special memories, I thought it would be fun to show them off by creating a photo display of all my daughters’ Halloween costumes over the years! 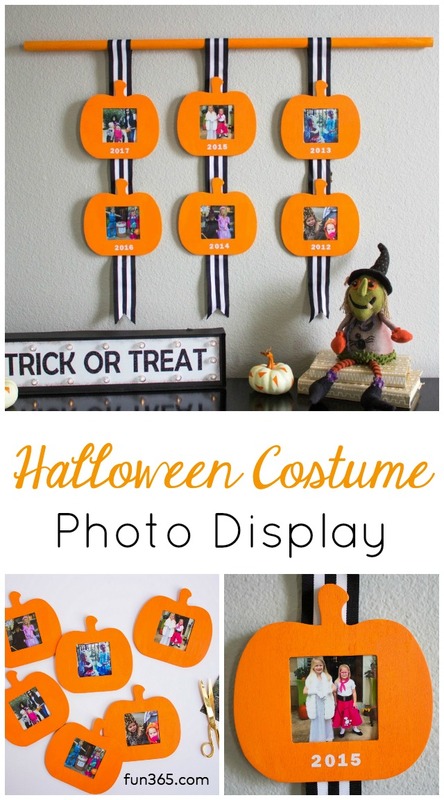 Made from pumpkin photo frames from Oriental Trading, this DIY photo display is a simple piece of Halloween decor you can make yourself and a fun way to see how your kids have grown and their interests have changed! How cute are these two girls? This was the year that Stella went trick-or-treating as a movie star and Hazel went as a 50’s girl wearing a poodle skirt! To create the photo display, I used a set of wood pumpkin frames for Oriental Trading, painted them orange and added number stickers. Then I glued the pumpkins to lengths of ribbon that I hung from a wood dowel. 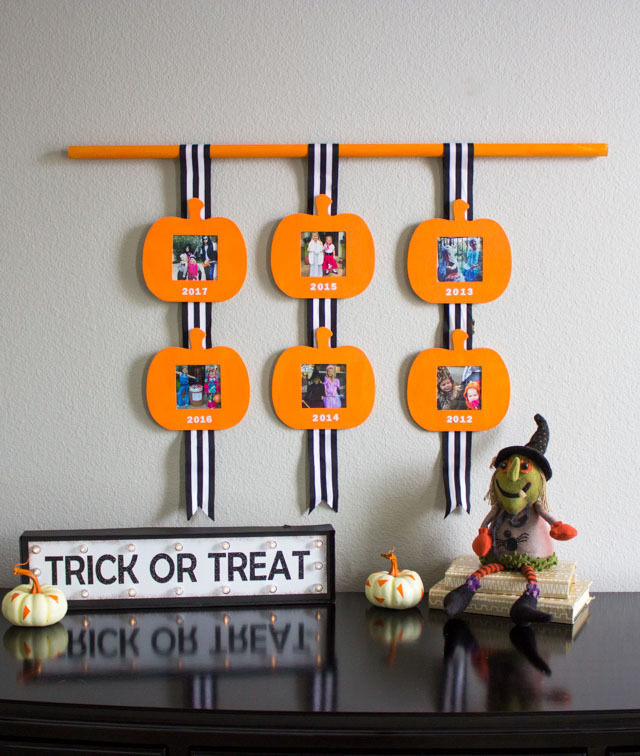 The pumpkin frames come as a set of 12 so you can go back lots of years in your photo display, and save some extra frames for future years. Just add them to another ribbon on the dowel! Head to Oriental Trading’s Fun365.com for the step-by-step tutorial and full list of supplies. This post is sponsored by Oriental Trading.